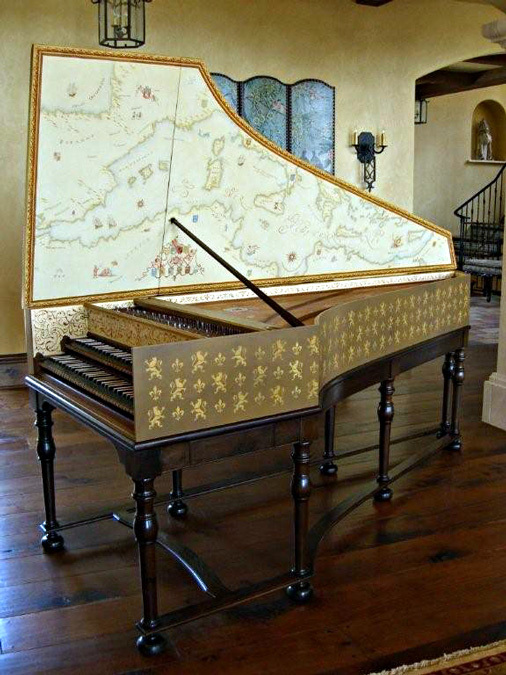 This double-manual French harpsichord is based on the instrument made by Pierre Donzelague in Lyon ca 1711. The client had the idea to paint an early map inside the lid, as a sort of twist on the more traditional landscape. Together we looked at several maps from the late 1600s and early 1700s, and chose lots of the little embellishments that make those maps so engaging. We also came up with the painted arabesques for the keywell surround and the soundboard surround. The soundboard painting is a faithful copy of the original.